The game of union has changed and continues to evolve in the professional era. Back in the good old amateur days of the 1970s, the number of set-pieces in an international game would tend to outnumber the breakdowns, in a rough proportion of two scrums or lineouts to every ruck. If we look at the battle between the top two sides in the world in Dublin last November, it is a very different tale. 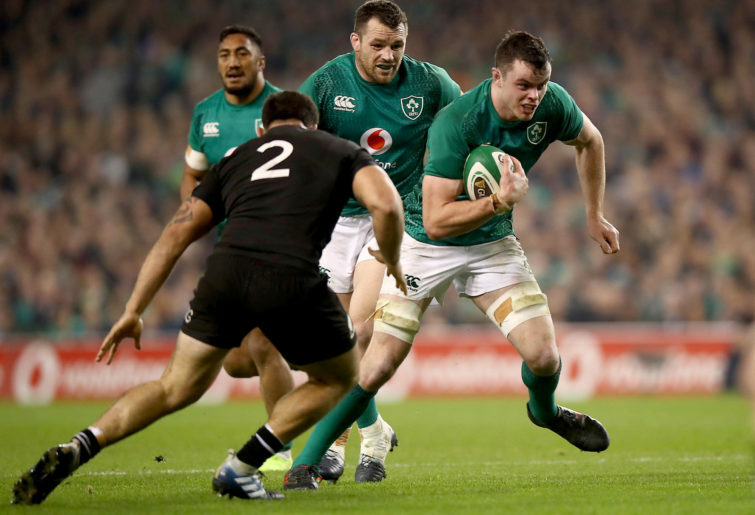 In the match between New Zealand and Ireland, there were 33 set-pieces and 262 rucks. A ratio of 2:1 has been turned into 1:8. Ball-in-play time has doubled, if not tripled, from the amateur days. The game has been turned on its head, and is trying to learn how to dance upside down. The positional requirements of rugby union are becoming less specialized as a result. While there will always be a place for square blokes who can stand in the scrum and lighthouses who can leap in the lineout, there is ever-decreasing room for players who only perform well at the set-piece. A few years ago, Phil Larder would say, “If a team of union players walked through the lobby of this hotel now, you could guess their positions from their body-shapes. If a league team walked past, you would struggle to tell the backs apart from the forwards”. Now that line is blurring, and the professional game of rugby is moving towards league at a rate of knots in terms of both uniformity of body-shape, and the skills crossover between forwards and backs. “There are great opportunities in the game to change it. There is no reason why you can’t play nine forwards. “We haven’t tried him [Nowell] out but he is definitely an option. He has great ball-carrying, great tackling skill; he puts his head over the ball, he’s a tough little bloke. Jack is a rugby player, one of the most highly skilled players at the breakdown. He could play as a ninth forward because he understands the game. He is going to be the new breed of player. There have been some successful hybrids over the past few years. Radike Samo and Pierre Spies could both play number 8 and wing at a high level with equal facility. Brits played in the backfield against the kicking game, and could run, pass, step and offload better than most professional backs – but he was a kick in the guts for rugby orthodoxy. That is the problem with the growing breed of back/forward hybrids in a nutshell. They run headlong into the ingrained attitudes of traditional union thinking about the game. Both Sam Burgess and Andy Farrell collided directly with them after transferring from league to union in the second half of their playing careers, and the result was a couple of train-wrecks which could only be saved by Burgess returning rapidly to league as a player, and ‘Faz’ moving into coaching in union. Nobody could decide whether either player was a better prospect in the back-row or in the centres. Andy Farrell had played in every row of the scrum, and at outside-half in league, and he could move freely between forwards and backs. He ended up playing inside centre for England against South Africa during their disastrous 36-0 loss in the group stages at the 2007 World Cup, and was not seen in a starting role again for the remainder of the tournament. Burgess was a forward in league, but while England envisaged him as a number 12, his club Bath wanted to develop him as a blindside flanker instead. Ultimately, Sam Burgess was wrongly scapegoated for England’s failure at the 2015 World Cup, and the underlying reason was that he didn’t comfortably fit the stereotypes of amateur union thinking. Well as he played in the pool games, it counted for nothing when the time came for that far more important task – to point the finger and allocate blame after the event. The ‘leaguer’ was a sitting duck. 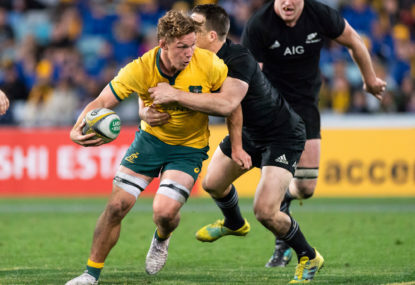 Michael Hooper has run into much the same kind of criticism in Australia. Despite being a defensive workaholic and one of Australia’s top two attacking players of recent times (along with another leaguie, Israel Folau), Hooper doesn’t fit the mould of a traditional number 7. He has the speed and quickness of an inside back, and that enables him to defend in the channel usually occupied by the outside-half in defensive situations, and be utilized as an extra centre on attack. But however many tackles Hooper completes on defence, and however many breaks he makes with ball in hand, it seems that his lack of orthodox attributes for the position in which he plays will always be held against him. 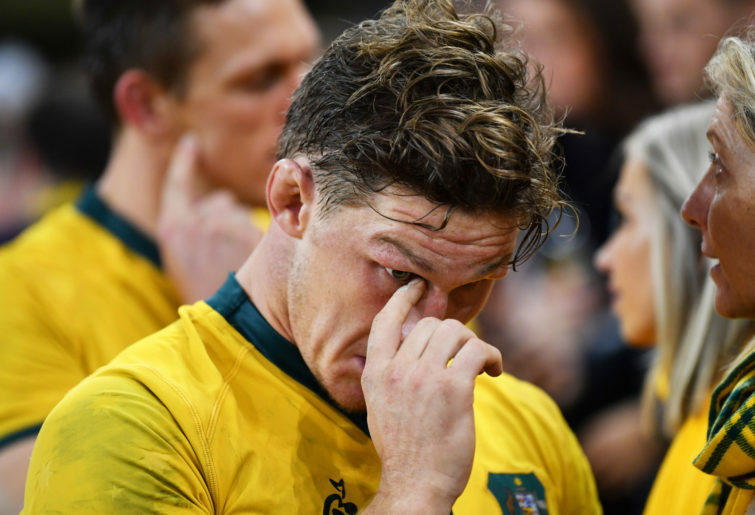 Does the fault really lie with Michael Hooper, and his inability to fulfil the openside ideal which exists in the eye of the beholder? Or does it reside with the beholder’s unwillingness to adjust their viewpoint and accept changes which have occurred, and are occurring in the game right now? The choice probably depends on your background and your vision of rugby’s potential – but most top coaches would come down in favour of the latter. Coaches tend to see the positives and immediately start thinking of ways in which unusual or ‘hybrid’ abilities can be used to progress their team, and the game as a whole. With that in mind, let’s take a look at what Eddie Jones may have seen in Jack Nowell to justify his assessment. The clips come from Exeter’s recent Champions Cup game against Top 14 side Castres, Nowell’s comeback match after a two-month injury lay-off. Gone are the Corinthian days where a winger would pride himself on his ability to keep his shorts a pristine shade of white, unwashed from game to game. Jack Nowell is the opposite, he prides himself on the number of times he gets his hands (and shorts) dirty. If you want to move the ball to the sideline in the modern game, you had better make sure that you have backs who can clean out in those wide areas, which are so sensitive to turnovers. Nowell (in the blue hat) has just finished cleaning out one Castres forward in the 15m zone when he picks himself up to punch a hole in another at the next. If he doesn’t ‘move the pile’ immediately, the inside defence will be set on the following phase and there will be no play for Nic White to make. In both instances, Nowell is following the ball to the base of the ruck as an alternative halfback, using quick changes of direction and leg power to break right up the middle of the field. Who is to say that Jack Nowell’s lack of top-end gas is not amply compensated by his skills in all contact situations? Who is to say that this quality will not make him in time an invaluable ‘ninth forward’ for his country? It may not be traditional or orthodox, but it works for the teams that pick him. It may be difficult to accept the Jack Nowells and Michael Hoopers of this world – the backs who can play as ninth forwards, or the forwards who can play as an eighth back. 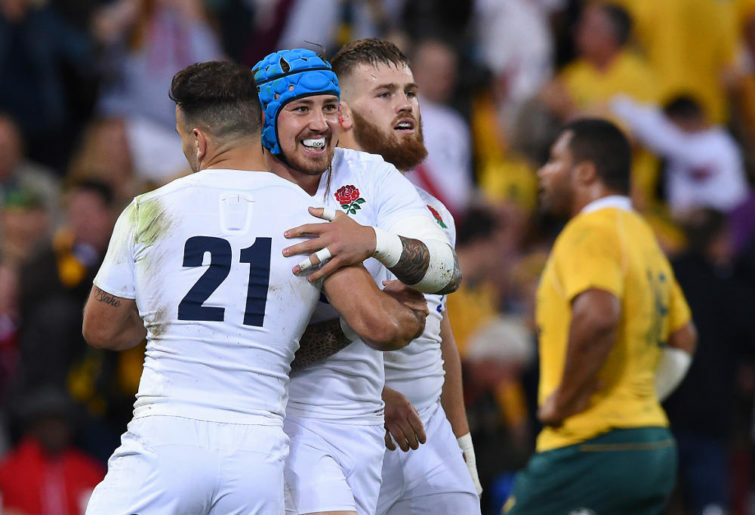 Their hybrid presence is slowly changing the form of rugby, although in reality it is the changes that have already happened in the game’s evolution which have encouraged their arrival on the scene. Rugby changed, and they came. Even if they were made slightly tongue-in-cheek, Eddie Jones’ comments show that coaches are looking actively and positively at the possibilities this kind of player presents. At the same time, such developments will move the professional tier of the game further towards an eventual re-union with league, and that may not be to the taste of every rugby traditionalist. There are some who will never accept that both games are played with the same shape ball. When Parzival was searching for the Holy Grail, his greatest opponent turned out to be his own brother from the far side of the world. When both were unmasked after a duel, Parzival finally realized “I was fighting against myself”. Those brothers shared a common origin, if only they had the sense to recognize it.